You don’t have to participate in an auction on eBay to buy something. If you want to make a purchase without going through the eBay auction process, you can usually find the item and use the Buy It Now feature to purchase it immediately. If you want to Buy It Now on eBay and avoid the auction process, browse the listings or visit eBay Stores. 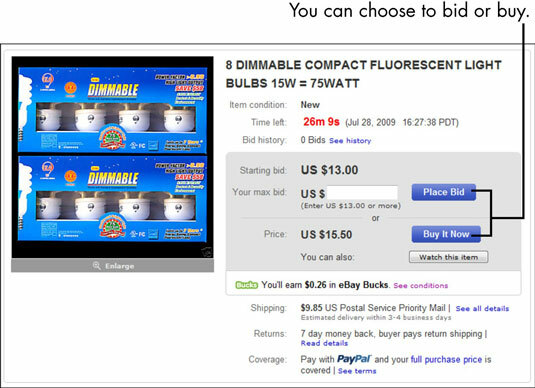 You can also isolate these items by clicking the Buy It Now tab when browsing categories or performing searches. 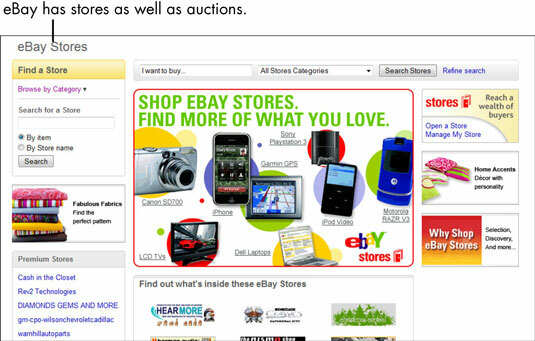 Visiting eBay Stores (see figure) is as easy as finding a store item in an eBay search or clicking the eBay Stores link from the home page. Thousands of eBay sellers have set up stores with merchandise meant for you to Buy It Now. eBay Stores classify merchandise in categories just like eBay, and you can buy anything from socks to jewelry to appliances. Sellers who open an eBay Store have to meet a certain level of experience on eBay. When you buy from an eBay Store, you’re protected by the same fraud protection policy that covers you in an eBay auction. More and more sellers are listing auctions with a Buy It Now option, which is available for single-item auctions. This feature allows buyers who want to purchase an item now to do so. Have you ever wanted an item really badly and didn’t want to wait until the end of an auction? If the seller offers Buy It Now, you can purchase that item immediately. If you’re the seller, you can entice your bidders to pay just a tad more to have the satisfaction of walking away with the item free and clear. But there’s a twist to the Buy It Now option: The listing begins as an auction. If the item receives a bid, the Buy It Now option disappears, and the item goes through the normal auction process. If you want the item now, just click the Buy It Now button, and the item is yours for the Buy It Now price. Sellers with merchandise they’re ready to sell often list an item at a fixed price. When they do, you can buy an item as soon as you see one at a price that suits you. For a variation on a fixed-price listing, the seller adds the Make Offer option, which enables buyers to make an offer for the item. With the Make Offer option, the seller doesn’t have to accept the offer: They can also turn you down or make you a counteroffer.